By the time Gaylordsville was fifteen years old, the need for a school began to be felt, and in 1740, the schoolhouse was built. At first it was supported by voluntary contributions, but in 1760 a school district, #14 was formed. This allowed the School Committee to lay and collect a tax to run the school. A certain part of the tax could be paid in firewood. The School Committee held annual meetings or oftener if necessary, to take care of any business necessary to run the school for the ensuing year. No scholars living outside of the School District were allowed to attend school except by permission from the committee. For a number of years, beginning in 1843, a summer session was held as well as the regular winter term. Although not stated in the records, it appears that the youngest children attended the summer term and the older students the winter one. In 1849 the teacher's pay was not to exceed $1.25 a week! By 1850 the school was in need of repairs as the Committee never had money for any but the most needed ones. 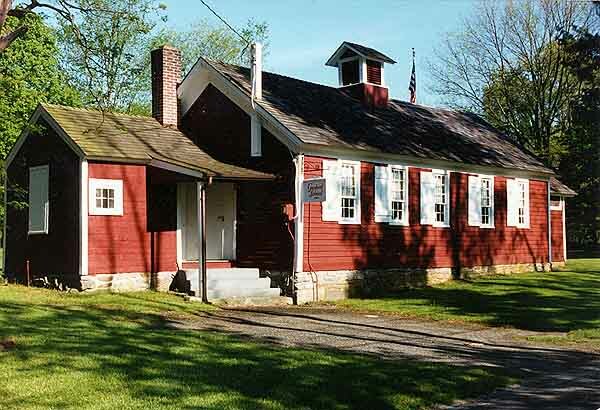 Several meetings were held to decide whether to repair the school or build a new schoolhouse. Whereupon, many of those who opposed the plan refused to pay the tax and it could not be built. Finally, in 1858, the old building was moved a short distance onto a new foundation and repaired. In 1872, the school, which had become too small, was enlarged and extensively repaired. The north end was extended fifteen feet and an entry and wood house added to the south end. The repairs included new rafters and roof, new windows, new plaster, a new floor and a new chimney. The original frame, however, remained intact. In 1895 Miss Jacoby of Falls Village was the teacher. Other teachers of that period were: Miss Hart, Edith Rodger, Miss Tyler, Clifford Marsh, Edith Dean Starr, Agnes Barnum Hurd, and Edith Wadhams, though probably not in that order. George Newton taught until 1907. He was followed by Charles Soule, who was there until 1915. His place was taken by his daughter, Bessie Cornwell, who taught there for 42 years. When she retired in 1957, she had completed 50 years of teaching. In 1935, with the closing of the Waller District School, change began to take place at the Gaylord School. All of the students of Gaylordsville now came to one school, and the grades were limited to six to accommodate them. Electric lights were installed and the coal stove replaced by an oil heater. In 1946, the Gaylordsville School Association was formed by the parents of the students, its aim being to improve the general welfare of the school. Largely through their efforts, running water was obtained in 1952. A small addition housed lavatories, doing away with the outside toilets. Gaylordsville's population was now growing and one by one the higher grades were transferred to New Milford. In 1958 Mrs. Elizabeth Reynolds came to teach grades one through four. In 1961, she was replaced by Mrs. Arthur Newton who taught grades one through three, and in 1964, Mrs. Donald Wharton came to teach grades one and two. Early in 1967, the New Milford Board of Education announced for a variety of reasons it was no longer practical to keep the school open and it would be permanently closed in June. Gaylordsville would lose the school where for 227 years its children had started their education. The announcement was received with regret. The school, the last one room school to be operated in the state, had earned their affection during its long career. A group of Gaylordsville residents soon began working to provide for the preservation of the building. At a town meeting in 1968, a resolution was passed barring its sale, as this had always been the fate of schools no longer used. No deed to the land could be found, so it was assumed that the land would revert to the owner of the surrounding property. Mr. Norris Wildman, owner of the property at the time, agreed to relinquish to the town whatever rights he might have if the school was to be preserved. In 1969 a resolution was adopted in a town meeting calling for the restoration and preservation of the school as an historic site. The Board of Selectmen appointed a committee to be responsible for this project. In 1975, the Gaylordsville Historical Society was started with its first president, John D. Flynn, Sr. The purpose of the organization is to bring together the people interested in the history of Gaylordsville and to display, preserve and protect items of historical interest and significance to the community. During the Spring and early Summer of 1998, the interior of the schoolhouse had a minor renovation. The walls and ceiling were replastered and painted and the 1960 era floor tiles removed to expose a narrow width wooden floor from the late 1800's - early 1900's. If you can't come to the schoolhouse, please visit the pictures below.